The Riedel Sommeliers Chardonnay Wine Glass was designed to highlight the velvety, supple texture found in Chardonnay wines, and emphasize the fruit and long, balanced finish. This classic Riedel shape allows young wines to express all their invigorating freshness, while more mature wines are encouraged to deliver the nutty, spicy, mineral flavours so typical of the variety. Recommended for: Albariño, Bourgogne Aligoté, Bordeaux (white), Burgundy (white), Chablis, Chardonnay, Chenin Blanc, Corton-Charlemagne, Hermitage blanc, Marsanne, Meursault, Pinot (Blanc, Grigio, Gris), Sauvignon blanc (Barrique), Sauvignon-Sémillon (Barrique), Viognier. Size: 8-1/2"H x 2-3/8" Dia., 12-3/8 oz. What are the dimensions of the glass..how tall? 8.5" tall, mouth is 2 3/8" wide. This glass makes as much difference in Chardonnays as the Cabernet/Merlot/Bordeaux does for Cabs. Highly recommend. Hi the dimensions are: 8-1/2"H x 2-3/8" Dia., 12-3/8 oz. Are these the lead-free or the lead crystal? 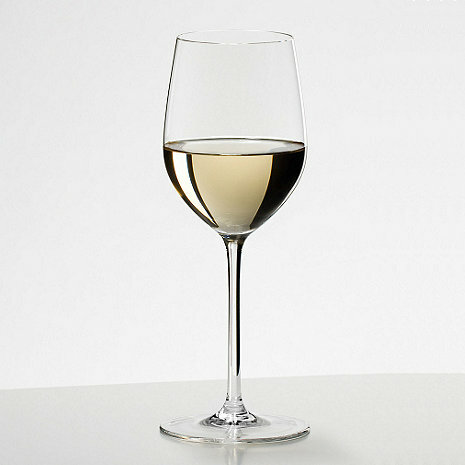 BEST ANSWER: The Riedel Sommerliers Chardonnay Wine Glass (1) are lead free. All of the Reidel glasses we carry are lead free. If you like high-end Chardonnays, particularly those from California, then this is a must-buy glass. We have done side-by-side tastings of Chardonnays with this glass and the lower-priced Vinum Series, and this glass significantly improves the nose and flavor balance of such wines over the lower-priced option. However, be warned that imperfections in the wine (particularly in less complex lower-end wines) will be amplified. If you typically drink Chardonnays that cost less than $40, the Vinum Series actually makes those wines taste better. I love these Reidel glasses. My only complaint is that I was replacing one of a set and because 25 years have passed, this one does not exactly match the rest of the set. Held and used by itself it's fine. Compared to the rest, it's visibly different. The bell is smaller for one thing and that slightly changes the presentation of the wine. I'm a little bit disappointed but I guess things are bound to change although I've found that not to be the case in some other lines such as Waterford or Baccarat. I always buy Riedel glasses makes a big difference in the taste. Exquisite glasses, even for everyday!! Costly, but worth the price! survived a clumsy person. I only use for special occasions. Hand wash - amazing stemware for the finest wine drinking experience. These glasses are excellent and feel luxurious when you use them. They are very thin so you have to be careful with them while cleaning and using but that is what sets them apart and is quickly noticed when people use them. Its obvious they are expensive because they are much thinner than any glass out there including ALL other series of Riedel glasses. Sits on the table nicely. Great for entertaining. No complaints. The finest available wine glass. Even though I use the glasses (I bought 4) just to treat myself sometimes to a glass of wine, I'm so cautious and concerned about breaking them [I already broke one right out of the box, but Wine Enthusiast (and Riedel?) was wonderful about giving me a replacement] that I don't use them every time. Maybe my imagination, but it does seem to make the wine taste better. These are lovely glasses. However, I already had some that I bought three years ago, and since then Riedel has made them a little thicker, especially in stem. If I had known this, I would not have putchased them. Buyers can tell because the older Riedel Sommelier glasses had the name etched on the edge of the base; these newer ones have logo at the center of the base. I'd recommend these to a friend, but only if they were starting their Riedel collection now, not trying to match the even better stemware of yesteryear.